Colloidal Silver is somewhat 'in vogue' at the moment, and with antibiotic resistant bacteria on the rise, we will only see the use of this powerful natural remedy becoming more popular in years to come. Made by suspending microscopic particles of silver in a carrier solution, this unique and intuitive health remedy is able to kill bacteria on contact. As well as being an antibacterial, it is also an antiviral and anti-fungal agent. The most common ways to use colloidal silver are on the skin (topically) or internally (sub-lingually or orally). Although the solution itself is very effective (as has been proven in laboratory tests seen under microscopes) the biggest challenge is getting the colloidal silver to the problem area. Obviously if it is a nail infection or something on the skin, this is a no-brainer but what if it is inside your body? A new method of administration colloidal silver has been much talked about in recent times. 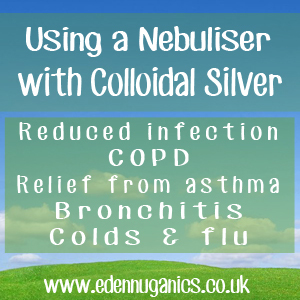 We are talking about the benefits of inhaling colloidal silver with the use of a nebuliser. When inhaled, colloidal silver will not only help to fight lung infections and kill harmful bacteria from the respiratory system, but is also able to be absorbed directly through the lungs into the bloodstream where it can help to improve general health. Nebulisers have been around for decades and are used to administer antibiotics or anti-inflammatories to people with COPD, Asthma and other chronic lung disorders. The nebuliser is nothing new but what is new is replacing the conventional medicine with something a little more gentle and natural. Firstly, nebulisers are not too expensive and can be picked up in a chemist or online for about 35-50 euro. Follow the instructions on your specific brand. Next, fill the medicine cup with high quality colloidal silver. To avoid spills, close the medicine cup tightly and always hold the mouthpiece straight. When in use make sure your lips are closed firmly around the mouthpiece so that all of the vapour goes into your lungs. If you have a mouthpiece covering your nose and mouth then this will not be a problem and you can just breath normally. Breathe through your mouth until all the colloidal silver liquid has been used up. Depending on dosage this should take around 10 to 15 minutes. This can be repeated once weekly for chronic disorders or once/twice daily when treating acute infections. If you don't own a nebuliser another simple method is to add colloidal silver to a fine mist spray bottle (obviously not quite as effective). Aiming to the back of your throat, apply 2 - 3 blasts while breathing in. This can be repeated up to 6 times a day. Safety studies on animals have found that long-term inhalation of silver into the lungs can sometimes lead to inflammation and reduced lung function. Although this is only known to occur after long term use.